Microsoft's purchase yesterday of Skype (barring any barriers that is) reminded me of a piece of Microsoft technology that I was keeping in storage - so I thought I'd do a quick photo-hack job and play a little "what if" game. Are there any readers of this site that owned this particular product? It was quite amazing for its time - I remember being upset when no drivers were created for Windows 2000, thus ending my use of the product (before Windows XP came out, Windows 2000 was *it* baby!). It had insanely cool functionality for the time - including voice command dialling, caller ID announcement, and it would link up with your contacts program on the desktop computer. Frankly, when I look at how "dumb" my landline phone is, I'd love to see something like this, updated with newest technology - like, say, Skype! I had that phone and, as you correctly stated, the most amazing part was the software: besides all the already mentioned functiionalities what put it aside any other software available at the time was the ability to handle both voice and fax using a single phone line. I never missed an incoming fax or answered the phone and heard the tone of the modem trying to establish a link to the fax. Great photo-hack! At first, I thought the article was going to be about what MS could put out on the market now that they've purchased Skype. 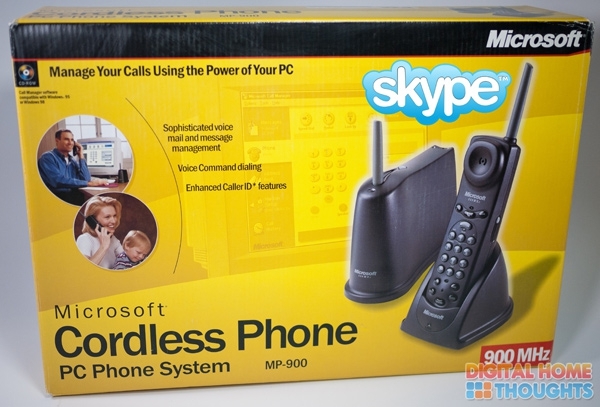 Although not having all of the options of your version, I have one of the vtech-skype units and you can use it as both a skype phone or a normal cordless phone. Much better than having to wear a headset to Skype (theres that verb again)! Wow, being able to link to your desktop contacts is cool. I've been looking for a cordless phone that can do that but there aren't many. Such a neat product, too bad MS didn't continue with it.